I find that many teens and young adults today often have interesting living arrangements. For one reason or another they find themselves without a place to call home. They are living on a friend’s couch or in their car or couch hopping from one place to another. Listen to this call I took from Daniel. He was trying to make it all work, but sometimes it’s just too much. Since Daniel had the option of returning to his parent’s home, I advised him to do just that. However, I realize that isn’t always an option. If you are trying your best to hold it together and make it all work out, even though you don’t have a place to call your own, here are a few things to think about. Forgive those that have hurt you. So, you didn’t just end up on someone’s couch out of the blue, whether it’s your parents, grandparents, a boyfriend or girlfriend, whoever, work on forgiving whoever hurt you. It could even be yourself. Forgive yourself or someone else for what they have done to you. It will only cause you to be bitter and angry if you hold onto the pain they’ve caused you. (Read more about how to forgive HERE). Make a plan and set goals. Start to figure out what your next step should be. If you don’t have a job then that might be the very first thing you need to do in order to move forward. If you have a job then your next step might be getting reliable transportation. If you have both reliable transportation and a job then you might need to think about how long it will take you to save up to get your own place, maybe start looking for a roommate and a place to rent. Clean up and help out. There’s nothing worse than having someone crash at your house and eat your food, make a mess, and leave their stuff everywhere. Make sure if you have to stay with a friend or family member, keep your things cleaned up, help out around the house, help cook and buy a few groceries or toilet paper when you can. Be grateful. Your friend will be more likely to let you stay if you have followed the steps from above, but also if you tell them how thankful you are for letting you crash at their place. After all, you might be on the streets if it weren’t for their help. Don’t be too critical of yourself. You don’t have to be perfect. You are allowed to make mistakes. If you make a mistake, then try to learn from that mistake. One step at a time. Winston Churchill said it well: Success is not final, failure is not fatal: it is the courage to continue that counts. Give it time. It’s going to take time to get back on your feet, repair broken relationships, get a job, save up money, and be able to find a place to live. These things in life do no happen overnight. Don’t rush into anything just because¦do things with purpose. During this time, you may struggle with your own self-worth. 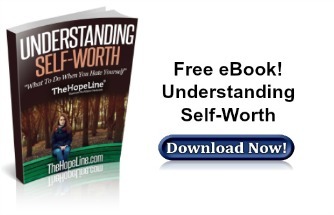 For encouragement and practical advice on how to increase your self-esteem, check out TheHopeLine’s eBook: Understanding Self-Worth.